Saturn trine Uranus 2016-2017: Positive Change! After a rather tough 2016, get ready for some good horoscope news: Saturn in Sagittarius trines Uranus in Aries toward year’s end, bringing positive change! What should you look out for? This is a liberating, uplifting energy! You can now alter the status quo without screaming ‘off with their heads!’ Saturn trine Uranus opens pathways for progress and innovation where before there were none. It allows you to marry the old with the new and make changes in your life that do not feel threatening or jarring. You no longer like the game? Rewrite the rules! Take this opportunity to implement positive changes in your life! On a world scale, we now see the upshot of decisions taken back in 2009. This Saturn trine Uranus aspect is exact on Christmas Eve, December 24th 2016, but it’s already in play. Then it hits again on May 19th and November 11th 2017, colouring the whole of 2017! An exciting door opens for you this Christmas (we don't mean in your virtual advent calendar). Can you feel the future unfolding? Sit up and pay attention! So where in your horoscope can you expect this positive change? Let’s look at Saturn trine Uranus, star-sign by star-sign. Remember, you can always dial 0207 111 6384 if you want to ask us a quick question that only one of our expert real life astrologers can answer. Saturn trine Uranus helps you blow away the cobwebs and welcome a fresh breeze into your sails, dear Aries. Your horoscope suggests that your original ideas begin to find wider popularity and acceptance by the powers that be. You are ready to reinvent yourself and imbue your life with deeper meaning. A long journey could invigorate you and increase your understanding of the world. This is a super-special twelve months coming - especially if you are born near the 10th or 15th April - when you can make far reaching changes in your life. Your intuition has been going strong in recent years, dear Taurus. But, as a rational and empirical sign, you may have found it hard to trust it. Your horoscope shows that you can now find new uses for this gift. For instance you could capitalise on your feel for emerging trends to earn a commission. Your foresight could also put you in a position of power and responsibility. On another level you could experience a breakthrough with your health. On a personal note, Saturn trine Uranus allows you to release old fears and find greater freedom. Your relationships have seen many challenges in the past couple of years, dear Gemini, both personally and professionally. Others seem to be difficult and reluctant to accept your ideas. This is all about to change. Your horoscope reveals that you’re starting to make inroads toward others. This could mean reaching a new understanding with a partner, gaining new and solid professional allies or gaining access to eccentric and unusual circles that give you a new platform to reach for your dreams. Saturn trine Uranus brings you positive friendships and partnerships. A career breakthrough is a distinct possibility, dear Cancer. If you’ve encountered nothing but closed doors in your attempts to find a job, get ready to catch a break! 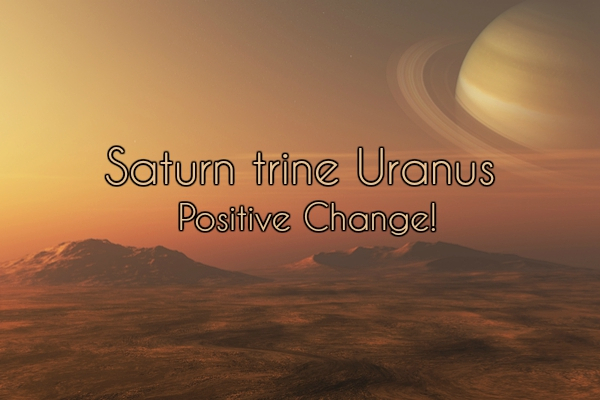 Saturn trine Uranus changes the rules of the game, bringing positive change to your career prospects. If, on the other hand, it’s been nothing but work and no play these days, expect things to spice up! You could get a promotion that opens new and untried career paths or work under a new boss that makes your job far more exciting. Your horoscope says it's time to put in the work and revamp your public image! You have been on a learning curve in your love life for more or less all of 2016, dear Leo. So it’s only fair that the pressure lets off a little allowing you to put all that you‘ve learned into good use. If it’s been hard going where love’s concerned, Saturn trine Uranus brings new and unexpected developments. These usher you into a more easy-going space with your sweetheart. Change is easier to handle now because you are willing to abandon preconceptions as to what should happen. Your horoscope suggests you'll become more open to a long-distance romance or to finding happiness with someone from a different culture. A family matter that’s been giving you a headache for a long time finally sees a positive breakthrough, dear Virgo. Fertility treatments begin to work; your household finances see positive developments; your home and family dynamics begin to change in a way that liberates you; and you’re far better able to deal with internal pressures and fears that have been holding you back. All this translates to positive changes in your life, curtesy of Saturn trine Uranus. Your horoscope reassures you that you are ready to release the past and step more lightly into the future. This Saturn-Uranus trine opens doors for you left right and centre, dear Libra! If you were struggling along before whilst on a steep learning curve, you can now get into the flow of things. If you were faced with people who were unpredictable and hard to please, you are now popular and easily able to develop your ideas. Your horoscope shows that communication lines open up in your relationship too, allowing you to finally see eye to eye with someone who’s been nothing but unreasonable till now - especially if you are born between the 7th and 15th October. Your finances have taken a bit of a battering in recent years, dear Scorpio, so you’ll be glad to know that help is on the way. Saturn trine Uranus is about doing things differently. Unusual work opportunities could come your way helping you build a stable income. Or you could find new ways to put your skills to work, boosting your self esteem and your bank account all at once. Your horoscope also shows the possibility of greater wellbeing based on a new diet and exercise routine or a medical breakthrough. If you are a Sagittarius born between the 7th and 17th December, you are having a tough Saturn transit right now. But you are also lucky. For unlike other Sagittarians who have had to stiff upper lip it, you have Uranus to help you! Saturn brings big responsibilities and you do need to shoulder them if you are to grow. But Uranus now brings potential into your horoscope for an exciting creative project, a speculative endeavour or a new love affair that could inspire you to put in the work. Saturn trine Uranus is all about finding joy in stepping up to the plate and building a new life for yourself. You are world-oriented, dear Capricorn, but this Uranus-Saturn trine is very much about your inner world. You are currently stripping down everything you don’t need and preparing to restructure your life differently in the near future. Progress now becomes faster and more effortless, where before it may have been full of personal sacrifices. This is the time to get rid of any excess baggage. Your horoscope also reveals you now have the power to vanquish an illness, resolve a family or residential matter or banish your insecurities. Let it go! You won’t be disappointed. Saturn and Uranus both rule Aquarius and so you are most attuned to the blend of their energies. The past year was a little murky at times, but you’ll feel right in your element from December onwards. Expect any resistance to your ideas to lift. Your horoscope shows that you can now draw attention from the right people and expand your influence. You can make VIP friends and establish yourself in ever wider and more respected circles in the coming year. It’s a year of great collaborations and projects to enjoy with others. The Saturn-Uranus trine is all about your career, your talents and your finances, dear Pisces. Chances are you have been trying to live up to great expectations and fulfil your responsibilities, whilst you figure out your next steps. Whatever role you’ve taken on, your horoscope suggests that you can now discover new talents that can help you stabilise your position. You can apply modern values to a traditional role now or reinvent the way you earn your living.